Many writers of History present the 13 vendémiaire as the brutal repression of a popular demonstration, by the army commanded by Bonaparte, a bloodthirsty apprentice dictator. This simplistic presentation figures prominently in the numerous untruths polluting the Emperor’s History. In this chronicle devoted to the matter, general Franceschi brings this striking event back to its rightful place. It is not at all a matter of a petty popular demonstration, but a large scale tentative to restore the monarchy, led by organized militias three times the size of the regular army, ready for war. It is not a matter of repression by police but a veritable urban warfare between opposing armed forces, one to defend the legitimate institutions, the other to topple them. On the 13 vendémiaire, general Bonaparte courageously saved the regime thanks to his rigorous and appropriate action. Accordingly, general Franceschi deservedly defines this historical episode as the “republican Anointing” of Napoléon, alluding to the Imperial coronation to come. On 13 vendémiaire Year IV (5 October 1795), Napoléon signs the republican pact binding him forever to the Nation. A providential man risen from History in the nick of time, general Bonaparte brings the triumph of the law against violence, saves the dawning Democracy and saves France from mortal chaos. From this decisive event the indefectible Alliance of Napoléon and the French people is born. After six years of a bloody Revolution, 1795 France finds itself in a critical situation. At war for three years, France must defend its borders in the north, the east and the Pyrénées against the united European monarchies worried about its revolutionary proselytism. The valor of its young generals and the enthusiasm of its armies enable it nevertheless to plot victoriously the danger of an armed invasion. - Collapse of the assignat, paper money of that time. On 30 July 1795, its real value falls to 5% of its nominal value. On 15 August it must be replaced by the Franc. Threat of famine: there is room for improvement in supplying wheat because the resources are lacking. Restrictions must be imposed on an angry population. The people of the Parisian suburbs of Saint-Marceau and Saint-Jacques march to the gates of the Convention on the 17 th of March to demand bread. The Saint-Antoine suburb does the same thing four days later. Some grain containers are pillaged. The insurrection explodes April 1 st. The crowd invades the Convention hall screaming “some bread, some bread!” Paris has to be placed in a state of siege under the authority of general Pichegru. On May 10, bread ration for Parisians falls to 60 grams per day. 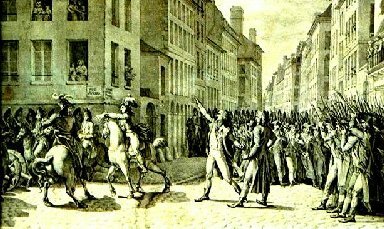 The popular discontent is also due to the political crisis following the overthrow of Robespierre on 9 thermidor Year II ( 27 July 1794). In charge of what has been called the Thermidorienne Convention, Robespierre’s successors quickly confront grave internal difficulties. The regime has to fight against two opposed subversions holding it in its pincers. On the left the people nostalgic for Robespierre who do not admit defeat. On the right, the royalists consider that the time has come to restore the monarchy. Condemned in this way to a see-saw politic, the thermidorians defend themselves by alternately striking one side and then the other, with no hesitation now and then to compromise with one against the other until the liberating unraveling of 13 vendémiaire. The first victims of repression by the victor of 9 thermidor, the Jacobins form a resistance very quickly after the fall of Robespierre. The agitator Gracchus Babeuf, the very first communist in the world, embodies the revolutionary opposition. As early as 3 September 1794 he launches his newspaper “Le Tribun du Peuple” (The Tribune of the People). The jacobine agitation grows bolder by the day. On September 28 there is a great demonstration called “terrorist” at Marseille. Other regions attempt to do the same but with less success. The Convention reacts forcefully. On 3 October it proceeds to arrest the “sans-culottes” leaders Chrétien, Clémence and Marchand followed by Legray on 9 October. Babeuf himself is imprisoned for a few hours on the 24 th. The anti-jacobine repression continues on 16 December with the condemnation to death and the execution of Carrier, the sadly well-known “executioner” of Nantes. On the 1 st of February 1795, Babeuf must stop the publication of “The Tribun du Peuple”. March 10, Toulon is the stage of an uprising of “sans-culottes” during which nine emigrants are put to death.
. After a short period of calm, the Jacobin agitation starts up again vigorously in the spring of 95, in favor of the popular hunger riots. On 10 April the Convention signs a decree ordering the disarmament of the “terrorists”. Its military committee receives on 24 April full power to purge the army units and headquarters of their Jacobin elements.
. May 4, there are reports of massacres of “patriots” in the prisons of Lyon, Montbrison and Saint-Etienne. May 7, executed on the guillotine are Fouquier-Tinville and fourteen jurors of the Revolutionary Tribunal of Year II, amongst them the engraver Prieur. On May 11, sixty “patriots” prisoners, are assassinated at Aix by royalists. May 17, a “terrorist” insurrection seizes Toulon for several hours.
. The Jacobin opposition experiences its highest point during the days of Parisian insurrection on 21 and 24 May. The rioters occupy in turn the Convention hall and the Hotel de Ville. The whole suburb of Saint-Antoine revolts. General Menou, in charge of restoring order indulges in a ruthless repression, with no hesitation to call upon the royalists, particularly the fanatics of the “jeunesse dorée”(golden youth).
. The province is not spared. In May and June massacres of “patriots” take place in many places, in particular at Marseille, Tarascon, Aix and Lons-le-Saunier.
. The last striking Jacobin event concerns a military Commission, It condemns to death on 17 June, six leaders of the May insurrection. They commit suicide in prison and go down in History under the name of “martyrs de prairial”(martyrs of the ninth month of the revolutionary calendar – May 20-June 18).
. The Convention does not stop only at repression. In order to attempt the disarmament of the oppositions, it works at innovations in institutional matters. On 22 August it adopts the Constitution of Year III, giving birth to the Directoire. It is then submitted to the people for approval by referendum along with a certain “Decree des Deux Tiers”(decree of the two-thirds) which is going start a row. Because of a very debatable anxiety about the preservation of the institutions stability, the conventionals indeed found nothing better than to grant themselves two thirds of the future assembly seats. The Constitution of Year III is approved by 1 057 390 votes against 49 978. The decree of the two-thirds experiences a very high abstention and gathers only 205 498 YES against 108 784 NO. The Convention, preoccupied by the “terrorist” opposition took much too long in assessing the royalist peril. The great difficulties in which the thermidorian Convention is struggling fills the partisans of the restoration of the monarchy with hope, a dream up to now unsatisfied.
. – The restarting of the armed rebellion in Vendée and Bretagne, then reinforcing it with military units disembarked from Great Britain. Added to the borders war, the derivative abscess created will weaken the military defense of the capital.
. – Intensification of the agitation in the country and the clever exploitation of all the spillover of the confrontation between thermidorians and Jacobins.
. – Finally, at the right time preparation and execution of a military assault on the Tuileries to topple the Convention and replace it with the royalty. Barely one month after 9 thermidor, Count d’Artois who lives in emigration in London designates a commander by the name of Puisaye for his “armée catholique et royale “ (catholic and royal army). As early as 30 September, First Minister Pitt grants him the means to make fake assignats, which says a lot about his cunning intentions. The following month, under the cover of plenipotentiary minister, an Englishman by the name of Wickam is sent to Switzerland to coordinate the actions of the royalist counter-revolution. A complete program of subversion is then put in place. The insurrection of the people of the west goes back to 1792. Its generic name is “chouannerie”, which comes from Jean Cottereau’s nickname Jean Chouan, known for his perfect imitation of the owl’s cry, which has become the rallying cry of the insurgents of Vendée. The rebellion found its roots in the measures of dechristianization of the revolution of 89 and grows in relation with the disgrace of the monarchy. In all of the west, but particularly in Vendée, the nobles and the catholic clergy exercise a strong influence on the population. The royalist and religious feelings are stronger there than anywhere else. The opposition to the central power makes itself known as early as the 2 nd of November 1789, date of the “mise à disposition de la Nation” (put at the service of the Nation) of the clergy’s properties. It toughens after the decree of 13 February 1790, which forbids the monastic perpetual vows. It explodes after the promulgation of the Civil Constitution of the Clergy, a downright declaration of war against the Catholic Church. Priests are forced to pledge allegiance to the Constitution. A large number of them refuse. Having become outlaws and subject to the death penalty, some swell emigration while many others do not hesitate to join the armed fight alongside the local royalist country squires, and involving the peasants in their devotion. The overwhelming papal condemnation of the Civil Constitution of the Clergy encourages the insurrection. A series of decisions clenches the escalation of violence. In response to the pope, the Legislative Assembly annexes Avignon, city of the Pontiff. Two special decrees of 29 November 1791 and 27 May 1792 organize the tracking of the “prêtres réfractaires” (rebellious priests). The veto of Louis XVI on 11 June 1792 only serves to aggravate the situation. Abominable massacres of adversaries, most of them “ci-devant” (people attached to the prior regime) and religious people take place in the prisons from the 2 nd to the 6 th of September, making this the bloodiest stain on the Revolution. On the 20 th of September secularization of the civil status and the institution of divorce are decreed. The next day, the Convention newly gathered abolishes royalty. The condemnation to death of Louis XVI and his execution on the 21 st of January 1793 finish to inflame the conflict. The Breton royalist conspiracy of the Rouerie marks the start of the revolt at the beginning of 1792. During the following years the rebellion will know many bounces, alternating from culminating points to rare periods of calm. An unending civil war pits thousands of peasants against the armies of the Republic in a merciless confrontation. “colonnes infernales”(hellish columns). The cruelty of these battles is indescribable. The conflict causes a large number of victims, so much so that some have described this war as genocide. Representative Carrier distinguishes himself in horrors at Nantes. A lull occurs after the very severe defeat of the chouans at Savenay on the 22 nd of December 1793. The chouannerie regains some favor after Thermidor. The Convention is going to use the carrot and the stick. After Carnot’s report on the 2 nd of December 1794, it grants amnesty to insurgents willing to give up arms within a month. The chouans answer by a surprise attack on 29 January 1795 on Guémené. The successes of the excellent general Hoche lead to the generous settlements of La Jaunaye on 17 February, signed by the chief of Vendée, François de Charette de la Contrie. In exchange for agreeing to stop their fight the chouans receive total amnesty, freedom of worship, a sizeable indemnity and most importantly the right to keep their weapons, in the heart of a Territorial Guard exempt from military service. The inflexible Stofflet and the fanatic priest Bernier break their ties to Charette and increase their hostilities. Stofflet is successful March 18 at Chalonnes but looses at Saint-Florent a few days later, before being beaten at Chemillé on the 2 nd of April. His camp is destroyed on the 26 th in the forest of Maulevrier. Trapped, he accepts at Saint-Florent on May 2 nd the same agreement as Charette had accepted earlier. Another chouan chief, Comartin preceded him by a few days at La Prévalaye but changed his mind before being captured May 25. The guerilla spreads as far as the Morbihan. It encounters difficulty after the death of its chief Sils who is replaced by Cadoudal who will become famous. The defeats of the chouanne insurrection finally persuaded London and its French emigrants of the necessity to support it with an expeditionary corps. Under admiral Warren’s orders an English squadron gets under way the 10 th of June with 4000 emigrants, 80 000 guns, 80 cannons, food, some uniforms and a quantity of fake assignats. In front, Puisaye and d’Hermilly are determined to urge to insurrection the whole western region of France and march on Paris. Hearing of this, the capital’s royalist plotters grow bold. On June 17 the “jeunesses dorées” (golden youths) cut large numbers of Trees of Liberty to their hearts content and trample on tri-colored cockades. On June 26 the emigrants land at Carnac. The day before, Charette violated his engagement and resumed the hostilities. He caused a massacre at a republican post at Les Essarts. He joins the chouans, Hermilly takes Auray but is defeated at Vannes. Hoche then launches his counter-offensive. He takes Auray back on June 30 and lock up the insurgents in the Quiberon peninsula. Hermilly resists violently in the Fort of Penthièvre, which is the lock of the battlefield. The Division Sombreuil, which arrived from England on the 15 th of July reinforces the expeditionary corps t Quiberon. After Hermilly’s death July 16, Penthièvre falls on the 20 th, accomplishing the complete victory of Hoche. Only Puisaye and a handful of emigrants are able to rejoin the English fleet. All others are either killed or taken prisoners. The repression is merciless for the emigrants, 748 of whom are shot to death in contrast with the amnesty given to most captured chouans. In retaliation, on the 2 nd of August Charette has some 300 republican prisoners executed. The failure of the landing at Quiberon does not discourage the royalist rebellion. On the 13 th of September there is a revolt at Châteauneuf-en-Thymerais stretching as far as Dreux. But the royalists are unable to go past Nonancourt where they are routed. Having just escaped capture, Charette continues the fight. But on thee 25 th of September he is defeated at Saint-Cyr and a few days later must evacuate his hideout of Belleville. In spite of the grave failure at Quiberon, the Count d’Artois does not hesitate to renew the experience. On 30 September the Ile d’Yeu sees the landing of one thousand emigrants supported by two thousand English soldiers. The Count d’Artois joins them on the 2 nd of October. The fourteen months separating 9 thermidor ( 27 July 1794) from 13 vendémiaire ( 5 October 1795) constitute the most unpleasant period in Napoléon’s career. Barely escaping the “girondine” terror, he cannot avoid a painful disgrace. His brilliant success at Toulon at the end of December 1793 procures “capitaine canon” (captain cannon) the friendship of Augustin Robespierre, brother of “l’incorruptible” (the incorruptible) who recommends him in these terms: “to the patriots that I have already mentioned to you I add citizen Bonaparte of transcendent merit. This person is Corsican. He offers only the guarantee of a man of this nation who resisted the stroking of Paoli and whose properties have been devastated by that traitor”. In concurrence with the mission representative Ricord, Augustin Robespierre imposes to the commander in chief of the army of Italy, general Dumerbion, the plan for the conquest of the Piemont conceived by Bonaparte. This first campaign of Italy in April 1794 is short, limited in scope and is not well known. The artilleryman Bonaparte commands an infantry grouping to reach the fixed objectives: Oneglia, Ormea, Saorge and the Col de Tende are conquered and make up the springboard of the approaching war of Italy. This new success brings Bonaparte a surplus of esteem from Augustin who then proposes to him to “monter”(go) to Paris to take command of the Garde Nationale of Paris and replace Hanriot. His mind preoccupied with a new plan for the campaign of Italy, Bonaparte does not feel intellectually free for this political post, nor is he morally devoted to it. His infallible flair dissuades him to get involved in this path. It was well for him to do so because the fall of Robespierre sends to the gallows his brother and most of his friends, amongst them Hanriot. His devoted friends Junot, Marmont and Sebastiani contrive a project of escape that he has the wisdom to decline not wishing to worsen his case. He made the right decision, as soon after, he is set free for lack of proof; nonetheless he is unable to dissipate all the suspicions. 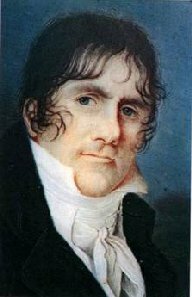 Having a lot of confidence in him, general Dumerbion links him to an ephemeral resumption of operations in the Piemont in the autumn of 1794. Later he is refused the active participation in the operation to re-conquer Corsica, occupied by the English and in fact will turn out badly in March 1795. Bonaparte tries in vain, but the suspicions weigh heavy upon him and do not seem to diminish, quite the contrary. On 29 March he is separated from the army of Italy, his only ambition at the time. At the beginning of May he is named commander of an infantry brigade in Vendée, which is in a state of insurrection. This assignment mortifies him. A soldier and moreover an artilleryman, he sees war only against the enemies of his country but not against French peasants however wrong they may be. And then, a general who has tasted victory, he cannot see himself having to obey another general whose competency is still to be proven. Also, his legendary intuition tells him that it is in the capital where the unraveling of this crisis will take place and that is where he must be ready to answer the call of destiny. For the moment it is important to get his nomination to Vendée annulled. He proceeds to Paris at the end of May 1795 to appeal to all the authorities possible that might support him. He multiplies the proceedings in order to drag things out. He wanders around Paris boiling, starving, hard up. His morale falls to its lowest causing him to loose hope in his future. His health begins to fail, to the great detriment of Junot keeping him company. As always, books are his only friends. Nobody gives him a friendly look. Military grandeur and servitude! Aubry, the War Minister agrees to see him on 15 June. This 45- year old artilleryman who has not advanced in rank past the grade of captain, gives a condescending look at this General artilleryman of 26 years and invokes his youth in order not to give him a sense of satisfaction. Cutting, Bonaparte’s reply has nothing to do with diplomacy: “Citoyen représentant, on vieillit vite sur le champ de bataille et j’en arrive!” (Citizen representative, one ages quickly on the battlefield and I have just come from there!). His cause is then irremediably compromised. And so, he uses the state of his degrading health and reports sick. On 16 August he receives the comminatory summons to rejoin immediately his assignment in Vendée. Risking all to win all, the unfortunate man demands an audience with the new War Minister Doulcet de Pontécoulant. In spite of this solicitor’s pitiful look, Pontécoulant is courteous enough to listen to him with attention. The former general of the army of Italy solicits with ardor his reassignment to this corps where he will be able to serve the Republic in much better ways than in Vendée. With clarity he explains the overall plan he has brought to perfection for the campaign during the last few months. By the look on the face of his listener, Bonaparte realizes that his natural magnetism and his power of conviction, operates well. Very interested, the Minister asks him to propose an elaborate project in a few days that he will submit to the Committee of Public Welfare for approval. Bonaparte protests, he does not need several days and spontaneously, at the corner of the table, on a few sheets of paper, he draws up the plan for the war of Italy that is to come. He cannot guess at this time that it will be up to him to apply the plan very soon. Struck down and conquered Pontécoulant quickly cancels the engagement in Vendée but keeps from transferring him to the army of Italy. Well aware that it is in his interest to keep near him an adviser with such clear and innovative ideas, he assigns him to the Topographic Service of the Ministry “to contribute by his zeal and insight to the work of planning the campaigns and operations of the Land forces”. 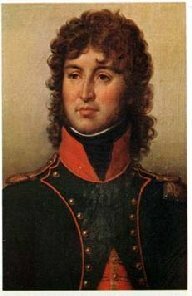 Soon after, Pontécoulant asks Bonaparte to draw up a project of directives for the Committee of Public Welfare for General Kellerman who is the commander in chief of the army of Italy. History’s irony: he writes nothing less than his own directives! After a few weeks Bonaparte has used up the charm of his bureaucratic and sedentary activities. Getting bored, he solicits the direction of a mission at Constantinople to reorganize the Ottoman army. Already an “Oriental dream” born from his readings at Brienne starts to occupy his thoughts. The answer is long in coming. To kill time he ventures to frequent some parlors in vogue, which are open to him because of his ministerial functions. His pitiful awkwardness, where only his gaze holds the attention, does not work to his advantage, except in the parlor of Madame Tallien - Notre-Dame de Thermidor – where he meets the “incomparable Joséphine”. The relations he forms in these places until now totally unknown to him, are going to become very useful in a short period of time. At the beginning of October 1795 Paris is in complete excitement. News of the landing of the Count d’Artois in the wagons of the English army at Ile d’Yeu throws the royalists in uncontrollable excitement. They no longer hesitate to pour in groups into the streets, the theaters and the cafés, clamoring their “vive le roi!”(long live the king!). The most excited are the “muscadins”, these young fashionable people conspicuous in their eccentric attire. In their cadenettes (strands of hair worn on each side of the face and falling down on the chest) and collars in royalist colors, they challenge passers by, harangue the spectators and spit on the consumers, coercing them to shout “vive le roi!” It has become a habit now for this “jeunesse dorée” to indulge in their favorite game of felling the Trees of Liberty and trampling on tri-colored cockades. In truth, the Convention provided an unexpected argument to the royalist opposition with the iniquitous Decree of the Two-Thirds, which we alluded to earlier. Let us recall that the Convention had decided that two thirds of the parliamentary of the Directoire that will succeed it would be taken from its midst. This measure seems dictated only by the selfish concern they have in preserving some sinecures. Indeed the people had approved it by referendum, but an 80% abstention made its legality doubtful. Worse than the outbursts of the “jeunesse dorée” is the staging for war that is taking place in the capital’s royalist sections which number forty-eight. The Convention had the imprudence of allowing these electoral assemblies to be transformed into National Guard units, substantially surrounded and armed. The Pelletier section established at the convent of the Filles Saint-Thomas, where the Bourse is now, constitutes the lance-head of what must rightly be called an enemy army in the very heart of the capital. The Convention finally becomes aware of the royalist danger up to now underestimated. It is too late to repent of having been too cautious about this opposition, to the detriment of the Jacobins. It is hereafter unnecessary to regret using the “jeunesse dorée” to repress the “patriote” uprising of May. For the moment the Convention must vanquish the roaring royalist insurrection or die. Its determination is founded on the democratic legitimacy. The royalists remain in minority in the country. Their tentative of taking power by the arms is nothing more than a putsch ordered from abroad. Confronted by this vital defiance, the people of the Convention get a shot of courage and dignity. They declare that they will install their headquarters permanently in their meeting rooms and resist in their seats with arms in hand until death. With eyes finally opened the Convention calls the Jacobin military staff it had dismissed, to form three “battalions of patriots”. It entrusts the defense of the regime to general baron Menou, the very person who had repressed the Jacobin uprising in May. Menou has only five thousand soldiers to face close to thirty thousand men of the royalist sections. The armed diversion of the west has fully filled its role. The situation has never been so critical for the Convention. The minute of truth happens on 12 vendémaire ( 4 October 1795). The Military Committee of the Sections of the capital, under the direction of Richer de Sévigny arrived to lay siege at the Le Pelletier section. General Danican is sent to direct the royalist troops. It is solemnly proclaimed that the decrees of the Convention are no longer recognized. It is an open declaration of war against the regime and obviously the Convention cannot tolerate it, save renouncement of its existence. It orders general Menou to disarm the Le Pelletier section and close its headquarters. Generals Despierres and Verdière are put in place to assist him. Three columns are to conduct the assault in the evening at the convent of Filles Saint-Thomas and the convent of Notre-Dame des Victoires. At the last minute general Despierres reports sick and general Verdière does not move. Menou himself lacks firmness. His laxity is attributed to his aristocratic origins and his sympathy for the royalist cause. In any event, he does not take advantage of his timely military superiority to make good use of force. Instead of attacking, he parlays. He withdraws after receiving the verbal promise of the insurgents to disperse, without disarming them, as had been his mission. Emboldened by this withdrawal, seen as a sign of the breakup of the regime, the Le Pelletier Section calls upon the other Sections to join it and march on the Tuileries to remove the Convention. The capital resounds with the beating of the drums of the Sections beating the alarm without interruption. The Convention appears lost. The night is the only time left to find a maneuver, the time necessary for the sections to assemble around the Tuileries. But given the ratio of forces at one against six, this will take a miracle. The weather is dreadful with the wind competing with the rain. Menou has a surge of energy around midnight. He launches an impetuous cavalry charge in the street of the Grande Batelière and clears it as far as the Faubourg Montmartre. In this way he gains a precious respite, which does not totally make up for his preceding mistake. The Convention proudly faces this desperate situation. It dismisses Menou from his command and places him under arrest. Barras is named Commander in Chief of the Army of the Interior with the mission to save the institutions with the greatest vigor. And what about Napoléon in all this? As if providence had been on a special watch, he is close by and moreover he is available. His departure for Constantinople had been delayed for diverse reasons. His hour has just arrived…as the royalist drums call for insurrection Bonaparte is in the neighborhood watching a performance at the Feydeau theatre. It is a well-known fact that Parisians never give up their entertainment even at the most critical times. The surrounding uproar causes him to guess that an important event is taking place. He proceeds to the Convention and takes a place in a meeting room gallery. He is recognized and is motioned to come and present himself. Turreau and Fréron are in Barras’s entourage. Barras is at the time preoccupied with associating himself with the best swordsman of the moment. All three of them knew the intrepid “capitaine canon” when they were commissioners of the Convention at the siege of Toulon less than two years before. They agree to propose to him the post of operational assistant to Barras who gives him three minutes to think it over. One has to be daring to accept taking up a challenge which seems lost in advance, and risk compromising his whole career on a throw of the dice. But general Bonaparte has already had the occasion to show that he was a clear headed and responsible chief. He quickly accepts the impossible mission he has been given. He has immediately made an assessment of the situation. The stakes are nothing less than salvaging civil peace between Frenchmen, making sure that law prevails over force. The royalists’ victory would signify a return to the bloody convulsions of the Revolution of 89, from which we had such difficulty extricating ourselves. 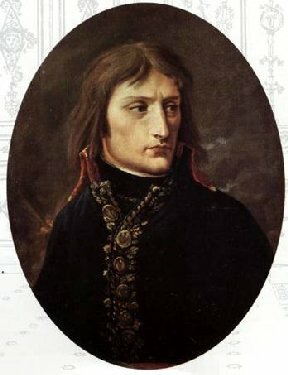 As to the nature of the confrontation, it is not a question of repressing a popular uprising, for which a real soldier like Bonaparte has great distaste, but to engage in a real battle between units in uniform. The fact that the combat takes place in the streets of a large city instead of an ordinary battlefield changes nothing to the ethical aspect of things. Let us take note at this time that 13 vendémiaire can be considered to be the first street battle in the History of the war. As for the handicap of the crushing numeric inferiority, it is not at all likely to discourage Napoléon Bonaparte who is never so much at ease than in this kind of plight. He is going to demonstrate this in a few hours, as he will later during the rest of his legendary military career. Bonaparte’s acceptance is nevertheless accompanied of an imperative condition: he demands freedom of movement. He does not want to hear of some supervision of his actions by some political commissioners, those usual horse flies who are detrimental most of the time. In this desperate situation nobody ventures to question the plenitude of his command. As an experienced artilleryman, Bonaparte in the blink of an eye is of the view that reversing the ratio of forces can only come from the powerful, opportune and precise use of artillery fire with cannon or grape-shot. Menou had not thought of that. At any rate, at the request of his successor, Menou indicates the existence of a park of forty cannons in the plain of Sablons. They must take possession of them as soon as possible before the royalists arrive and get them. Murat fulfils his mission with the greatest of zeal. He barely forestalls the Sectionaires who of course had thought of the same operation. It is also for him the first act of a phenomenal career. Bonaparte’s hastily gathered Etat-Major (general staff) becomes fascinated quickly by the authority and the decisive spirit of the new leader and as it will be narrated later by a witness, the officers present at this change of command in the midst of the action “look stupefied at this very agitated little man whose disorderly attire, his long hair and the dilapidated look of his clothes still reveal much distress”. The Convention now feels more reassured by the radiating energy of the one on whom its very survival depends. Bonaparte has the individual equipping of the parliamentary completed. At that time we hear president Legendre pronounce these historical words: “Let us receive death with the audacity that belongs to the friends of Liberty!” We can reproach the Convention many things except to have lacked courage at the moment of peril. Throughout the night they organize a corner of resistance. Bonaparte is everywhere, choosing the placement of the artillery pieces himself. He already knows that in order to give confidence to those who are going to fight, he has to be seen by them on the front lines. 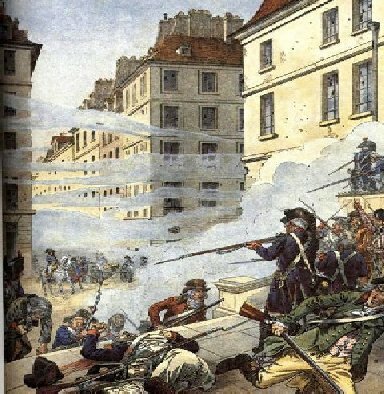 Around five o’clock in the morning the sectionnaires slip into the Hotel de Noailles and shoot on the steps of the Tuileries. At the same moment, an infantry column attempts to take the Pont Royal. This first attack is quickly repulsed. They spend the rest of the night and the morning making the final dispositions on one side, then the other. The forceful attack by the sectionnaires emerges late in the morning. The dispositions taken by Bonaparte, notably the wise use of the cannons, are going to prove to be of formidable efficiency, overturning the equilibrium of the forces. The confrontation is fierce and bloody during the hand-to-hand combat where cannons cannot intervene. Bonaparte stays at the advanced-posts commanding as close as possible, as he will never stop doing in the future. His horse is killed from under him but he emerges unscathed. After having contained the assault of the sectionnaires, Bonaparte goes into a counter-attack, his tactical process of predilection. Let us now hear from baron Thiébault, a witness, speak: “The general has us place two pieces of eight in the street of Neuve Saint-Roch, across the street from the church. The cannon shots go down the street. The cannons having thus toppled or scattered everything in sight, one hundred men of the patriots battalion, followed by a line battalion, debouch from the cul-de-sac and approach those of the sectionnaires who are still in front of the gate and who occupy the Saint-Honoré street. The clash is violent, and there is hand-to-hand combat. Nevertheless our troops gain some ground. 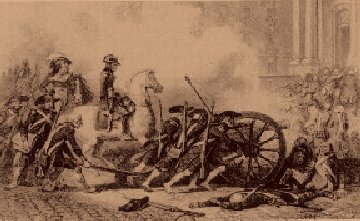 Six artillery pieces are quickly put into position to fire, three on the right, three on the left of the cul-de-sac, and we finish routing the sectionnaires who retreat in a big hurry towards the Place Vendôme and the Palais Royal. The combat is directed by general Bonaparte himself”. Meanwhile, the Tuileries offer a surrealist spectacle. The lobby and ground floor have been transformed into a country hospital. Surgeons are busy caring for many wounded lying in the straw. Improvised nurses assist them. They are the wives or daughters of “conventionnals”, here to share the fate of their husband or fathers. According to baron Thiebault, “it was at the same time a Senate, a government, a headquarters, a hospital, a camp, a bivouac”. The sectionnaires disorderly retreat completes their total defeat. They will not be heard from again. On this day of 13 vendémiaire, two hours were sufficient for Bonaparte to reverse the course of France’s History. The brutal collapse of the royalist insurrection proves, as if it were necessary, that it did not rest on any popular and democratic foundation. This victory has cost 300 dead. It is a lot! But what is it in comparison to a civil war that would have exploded had the royalists been successful?